BEMA International accepts cryptocurrency donations. Contact bema@blackemergencymanagersassociation to request specific cryptocurrency wallet id. NEW ORLEANS - Entergy New Orleans, Inc. officials today (Oct. 23) presented a $50,000 check to Delgado Community College to support the start of the Certified Line Worker Training Program, which was developed through a partnership between the Louisiana Energy Workforce Consortium (LEWC) and the Louisiana Community and Technical College System (LCTCS). Recognizing the upcoming need for skilled, trained line workers in the near future, electric utility companies, utility contractors and community and technical colleges from across Louisiana have come together to form the LEWC. Graduates of the 26-week evening studies program at Delgado Community College will obtain National Center for Construction Education and Research certification, be qualified for employment as a line helper and receive job-placement assistance. LEWC members were instrumental in developing the program's curriculum and designing the training facilities. "This is a great example of the type of cooperation needed between industry and our educational system to develop the workforce of tomorrow," said Charles Rice, president and CEO of Entergy New Orleans. "We're pleased to support this program and look forward to helping its graduates start rewarding careers in a job that is, in many ways, the backbone of the electric utility industry. We're also glad to continue our support of Delgado's workforce development initiatives." "The workforce of the Greater New Orleans region continues to be upwardly mobile thanks to job training partnerships like this one between Delgado Community College and Entergy New Orleans," said Joan Davis, chancellor of Delgado Community College. "We thank our partners at Entergy for their support, and we look forward to the day when this program's graduates are helping keep us comfortable, safe and productive inside all of our homes and businesses." 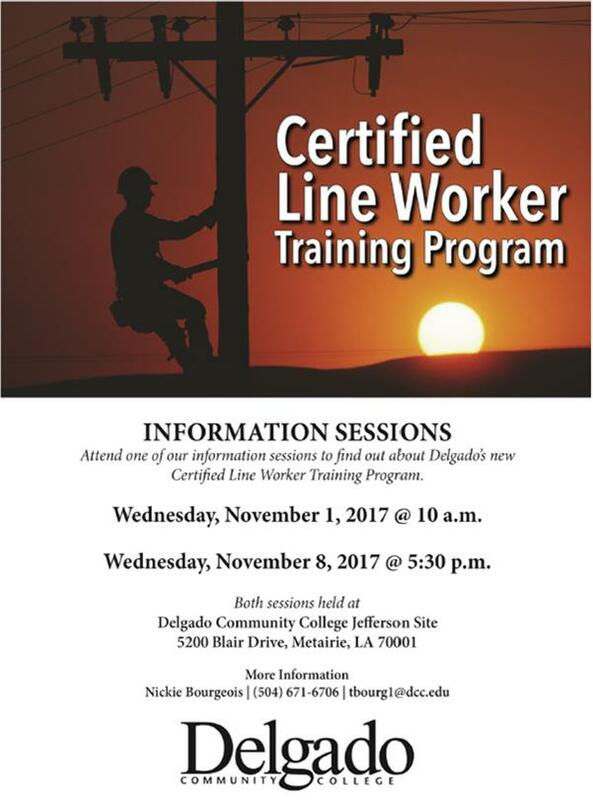 Delgado Community College and Fletcher Technical Community College will be the first Louisiana colleges to offer the Certified Line Worker Training Program beginning in January 2018. More information on the program is available at http://www.dcc.edu/academics/workforce/line_worker.aspx or by calling 504-671-6706. LEWC utility partner companies include: Entergy, Chain Electric, CLECO, DEMCO, Diversified Services, SLECA, Terrebonne Parish Utilities, Lafayette Utilities System, T&D Solutions, Willbros T&D Services, Linetec Services, Utility Lines Construction Services and Southern Electric Corporation. Delgado Community College is the largest, oldest and most diverse community college in Louisiana. More than 25,000 students are served by Delgado each semester. The college provides more than 100 degree, certificate and diploma programs as well as adult education and workforce development to residents of the Greater New Orleans region and a broad range of the Gulf South, other U.S. states and Latin America. Entergy New Orleans, Inc. is an electric and gas utility that serves Louisiana's Orleans Parish. The company provides electricity to more than 198,000 customers and natural gas to more than 106,000 customers. Entergy New Orleans is a subsidiary of Entergy Corporation. Drink for Life. Communities drinking and eating well. Mission is to increase the diversity of corporate America by increasing the diversity of business school faculty. We attract African-Americans, Hispanic-Americans and Native Americans to business Ph.D. programs, and provide a network of peer support on their journey to becoming professors. BEMA is a 501c3 Nonprofit Organization. All donations, and membership dues\fees are tax deductible. Once Again the World Stands with Cuba! ..Haiti. We will not forget. Show your support for disasters that strike our communities.